Hundreds of thousands of homes in Florida are still without power more than a week after Hurricane Irma barrelled through on her destructive path. And, unfortunately, there’s no clear end in sight for them, as infrastructure was so thoroughly destroyed in certain areas. With an average temperature in the 90s, days in Florida are miserable indeed for those without power. Restoration of power is a slow process in some areas. According to an article in the Washinton Post, it could be a while before everyone has their power restored. Duke Energy Florida said it would restore power to most customers by Sunday, a week after Irma made its first landfall in Florida. Some harder-hit areas could take longer due to the rebuilding effort. The power outages are in great number due to structural damage, which is why it’s taking such a long time to get it turned back on. Utility workers can only replace poles and lines so quickly. The extent of the damage also speaks to the massive size of the storm. Across the state, the explanations for the outages were visible alongside the road. “It’s a lot of trees and power lines and snapped poles,” said Kate Albers, a spokeswoman for Collier County, which stretches across southwestern Florida and includes Marco Island, where Irma made her second landfall. To “feeders” that send power to the largest number of customers individual neighborhoods. How many people lost power during the hurricane? It’s obviously going to take some time to repair that much damage. Some people have asked why the power lines in hurricane-prone areas are not buried. While it’s true that buried lines are less likely to be susceptible to wind damage, they’re susceptible to flood damage, which is part and parcel of a hurricane. Buried lines are very expensive to install and they are expensive and time-consuming to work on since they must be dug up to be repaired. What are the challenges people are facing during this lengthy power outage? For families like the Morrisons, whose Longwood home on South Hamlin Street has been without power for seven days, it’s small consolation. According to father Cecil Morrison, they’re throwing away what was once good food, cooking outside daily, and sleeping together in their living room to stay cool. “When we turn off the generator, the ice starts melting from the refrigerator and we had to take half of the meat over to our mom’s,” Morrison said. He went on to say it’s cost him about $30 a day in gasoline to run his generator every day over the past week. “Right now, I’m on the last three gallons of gas, unless I go into the Christmas funds and take the last of that,” Morrison said. For Morrison’s family, it’s not just the loss of food, either. They haven’t been able to store medication for one of their children properly, as it has to be stored in a cool place. Food is a real issue for many people. Everything that was in their fridges and freezers has long-since spoiled and anything that came into contact with flood waters must be discarded. When the power goes out for an extended period of time and refrigerators and ovens are inoperable, the risk of food poisoning is heightened. People should throw away any perishable food that has been at room temperature for two hours or more or any food that has an unusual odor, color, or texture. Additionally, people should discard any food that has come in contact with floodwater, even those that are wrapped or packaged in plastic. Some people believe that FEMA and the Red Cross will pay to replace spoiled food. This is not the case. While they are dispensing other types of aid, grocery store vouchers and value replacement are not included. (source) For those who have run out of food and can’t afford to buy more, food banks are their best bets. Businesses are reopening, but struggling. Some business are reopening, while others may cease to operate due to extensive damage. The lessons we can learn from this extended power outage. Those who study preparedness can learn a lot from the aftermath of a disaster like this. We can take these lessons and become better prepared when disaster comes knocking at our own doors. Preserve the food in your fridge and freezer when disaster is near. In situations like a hurricane, when you know it’s coming, you can take action to preserve the foods in your refrigerator and freezer. Canning is probably the best way to put these foods back, as dehydrated foods wouldn’t do as well in a damp environment. 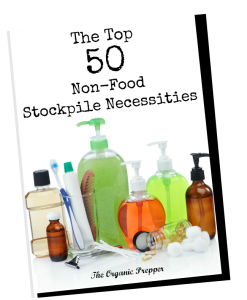 Check out this book for instructions on preserving the food you have on hand. If you can’t preserve it, consider getting rid of it. If you are expecting a monster storm that is likely to take down the grid, you won’t want to sit there in a house full of spoiled, rotting food. Eat as much as you can before the storm hits, and consider disposing of what you can’t consume. This is especially true if you plan to evacuate. Returning home to the stench of rotting meat would be awful. Store important things like food and documents up high. If you live in an area where flooding is a possibility, reorganize where your food is kept. If you have a second story or an attic, consider moving non-perishable foods up there. Same thing goes with documents. Also, consider waterproof pouches for important papers. Have a plan for staying cool. One of the most miserable things about this power outage is the extreme heat. Plans for staying cool might include battery operated fans, cooling cloths (these work very well), a kiddie pool with non-toxic water if any is available, Make sure to stock up on plenty of batteries. Have cash on hand. One thing to note in the information above is that credit and debit machines are inoperable. You will need cash, preferably in small bills, to be able to purchase things in the aftermath of a long-term power outage. Stock up on well-packaged emergency food. I recommend buckets with mylar pouches. They’re lightweight, can be easily moved, and can store a lot of food in a small amount of space. Go here to see the huge variety of products that are available. Have a way to cook that doesn’t rely on the grid. If you can go outdoors, a barbecue can work well to cook food. For the first few days, while it’s still safe, focus on the things in your fridge and freezer. Once those foods are no longer safe, move on to your shelf-stable foods. Another good option is this little emergency stove, which is safe to be used indoors. Be sure to stock up on plenty of additional fuel in the event that the power outage lasts a long time. Have extensive water storage. Water treatment plants have also been dealing with power outages, which means that they aren’t able to purify water. As well, many were inundated with millions of gallons of toxic floodwaters. The tap water is still not safe to drink in many parts of the state. Water filtration may not be enough in situations like this, so it is vital that you have a lot of water stocked up. I’m a fan of these 15-gallon water tanks, which are a bit easier to manage than the 160-gallon tanks, which won’t be able to be moved once they’re filled. Store these above flood levels, so in an attic or on an upper floor, if possible. If that isn’t possible, at least place them on shelves, counters, and tables when the floods are on the way. Your situation will be much worse if you plan to rely on the aid of FEMA and the Red Cross. 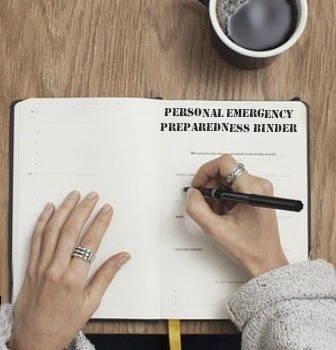 It’s essential to take matters into your own hands and prepare for the most likely concerns well before an emergency ever happens. If you wait until the disaster is nigh, supplies will be limited and you’ll be fighting with your neighbors to get what you need. As well, if you wait too late to order online, you run the risk of receiving your supplies once the emergency is over. Coming soon: the situation in the Florida Keys is even more dire than that of the rest of the state.